The rapper's first album in 16 years saw streaming and sales success in its first week of release. 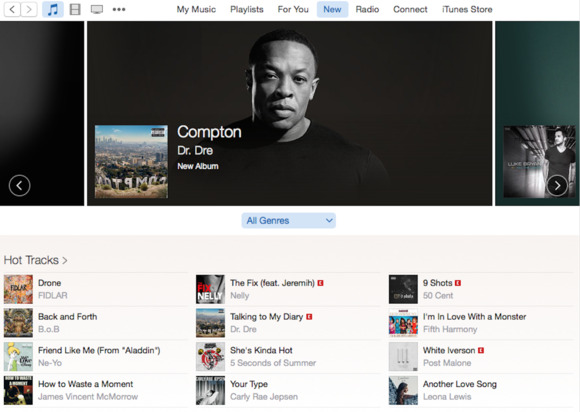 Dr. Dre’s long-awaited new album Compton: A Soundtrack debuted last week on Apple Music as the service’s first high-profile exclusive, and while the release was a big one, it was unclear if Apple could juice enough interest to make exclusivity worth an artist’s while. Now it’s clear that it is—or at least it was for Dre. Apple execs told the New York Times that Dre’s album was streamed 25 million times worldwide in its first week and sold nearly 500,000 iTunes downloads. To compare, Drake’s latest album was streamed 48 million times and Kendrick Lamar’s To Pimp a Butterfly 39 million times in their respective release weeks earlier this year. Those figures include Spotify, which has 75 million subscribers (though only 20 million pay for a premium subscription). Taylor Swift’s 1989, which is only available to stream through Apple Music, went from 5,000 to 2.4 million streams a week, according to Nielsen data provided to the Times (though it’s unclear where those 5,000 streams outside of Apple Music came from). Iovine and Dre built Beats Electronics and its music streaming service, Beats Music, then sold the company to Apple for $3 billion last year. Both joined Apple after the sale, so Apple Music was the obvious choice to exclusively stream Dre’s first album in 16 years. Why this matters: Apple is ramping up efforts to win over more Apple Music subscribers, and exclusives like Dre’s album are part of that process. The company is also ramping up an advertising blitz this month. Apple Music’s existing 11 million members are all on free trials, which convert to $10-a-month subscriptions after three months. But Apple has 800 million customers on iTunes, so it’s clear that Apple Music hasn’t yet tapped its full potential.